Drifting Sands performing at the grand opening of the Bluegrass Island Store. Springtime has come to the Outer Banks. Ok . . . it doesn’t feel much like springtime today, but yesterday, was First Friday in Manteo, the first First Friday of the season and the weather cooperated. A little bit overcast but temperatures stayed in the mild range with light winds. First Friday is really as much a celebration of small town life as it is an excuse to get out and enjoy the evening air, and last night’s event did not disappoint. There were two grand openings—Big Buck’s Ice Cream took over where the Manteo Coffeehouse used to be on Sir Walter Raleigh Street and Cory Hemilright opened a Bluegrass Island, a box office store in the Phoenix Shops. It was probably needed—Cory, the promoter and force behind the Outer Banks Bluegrass Festival, has a number of events that he is now associated with. At Big Buck’s ice cream was being scooped at an amazing pace—$1 scoops will do that and they were generous scoops. All very fresh . . . Big Buck’s prides itself on making their ice cream daily. 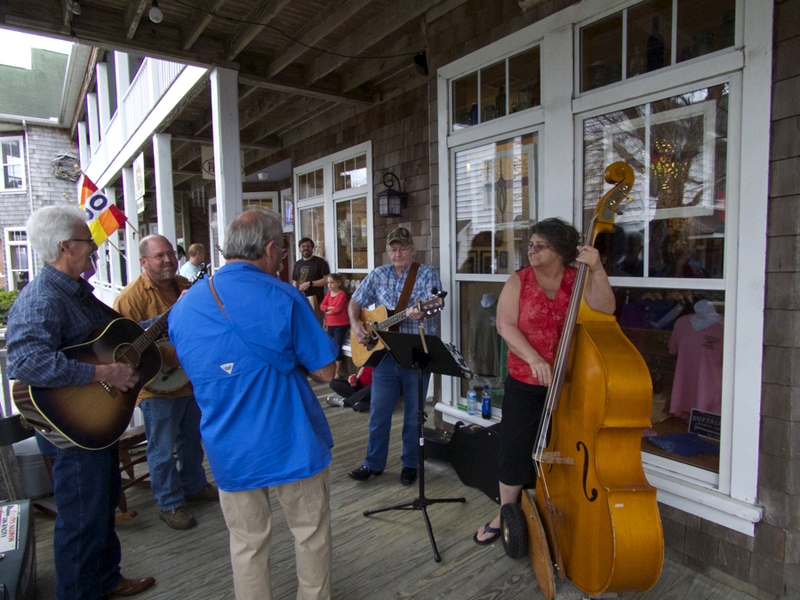 Over at Bluegrass Island local bluegrass band Drifting Sands was having a great time on the porch in front of the store. With temperature comfortable it was a perfect evening to stroll around downtown Manteo, stop by the taco table at Ortega’z, get a $3 tuna taco and think about the upcoming season.